What I saw at Taliesin, Frank Lloyd Wright's masterpiece of architecture in Spring Green Wisconsin. Lyrical moments in the organic shapes of huge white pines contrast so beautifully with the hard, rectileaner forms of the architecture. It strikes me as very Japanese, with windows like shoji, repeating roof peaks and angles. I was struck by how the residence sprawls and tumbles over the hillside, echoing the natural landscape, but also is an etude or variation upon it, with its undulating surface of planes in geometric shapes - triangles of roofs, rectangles of windows. And perhaps the most important element in the paintings is light. Once I started concentrating on how the architecture interacts with the light that falls on it, the paintings took on a highly abstract quality. After I had been working on the paintings for a while, I realized I was being influenced by another Wisconsin great, O'Keefe, whose talent for abstracting complex forms is legendary. Taliesin as my subject. At Taliesin, Wright's dynamic geometry surrounds you, it's a very powerful presence, which engaged my mind as an artist. When the manager gave me an up close and personal tour of Taliesin, I felt exhilerated and inspired. Right away, I went back to my studio, an hour away on a beautiful lake, and got to work. I spent the next three years painting the only comprehensive collection of contemporary paintings of Taliesin in the world. When I worked on the paintings, my poor brain and aesthetics were overmastered plenty of times, where I felt Wright's mind invade and take over. Then I was compelled to put the project down for a while until my saturation point had gone down and I could entertain his visual ideas again, until the next time I was overpowered. That notwithstanding, I was enchanted by his work. I met people who have lived or worked in Wright buildings for years and they say they discover new things about Wright's design to be fascinated by every day. I worked on 20 paintings all at the same time. Working on twenty paintings at one time is crazy, but that's what I did with the Taliesin work. Of course, I had to start them one at a time. Then I would work on each painting until I reached a point where I wasn't sure what was going to happen next and then I would start another one or two. In truth, a wasn't really sure where I was going with technique on the series until I pushed through the unknown and brought one painting to completion - the Romeo and Juliet Windmill, which was about the 7th or 8th painting I had started. So eventually they were all underway, all in different stages of completion begging to be resolved. But I do like big projects and hanging in there until everything comes to a point of resolution, even though it can be frustrating at times. Sometimes I had to struggle with a passage and paint it over and over again until it resolved. Some paintings were incredibly easy and just sprang up under my brush, like the Midway Barns, the signature piece of the series. My goals for Taliesin Through a Painter's Eye. In my three years of work on the 20 paintings, my focus in the Taliesin series has been to give a painter's eye view of Wright's work, that is, highly interpretive paintings, rather than elevation-type renderings. I created a series that was as much about Taliesin as it was about painting. I gave myself free rein to explore, interpret and improvise on what I saw, without being a slave to the architecture on the one hand, and hopefully without giving offense to Architecture on the other. How I did it. I used tempera, watercolor and oil paints. The tempera paints I made in my studio with pigments and egg yolk. Part of the warmth of the colors in the paintings comes from a particular french yellow ochre pigment that can only be obtained by making one's own paint. I learned egg tempera, which was popular with Italian Renaissance masters, through reading Cennino Cennini's Il libro dell'arte, a book written in 1437. I began in my studio with tempera with techniques I learned painting scenery in the theater - laying down patterns, spattering and washes. With a historic stencil, I laid down an oak leaf pattern, in honor of the beautiful old oak that crashed onto the residence roof, after providing hundreds of years of shade and beauty. I also scattered pine needles from my forest onto colored washes, leaving imprints behind on the painting. Then I went to Taliesin and worked on site, I weaving images of architecture into the pattern of leaves already on the canvas. I just brought one tube of brown watercolor with me, which was easy to transport and use in the field. Finally, back in the studio, I floated transparent oil glazes in intense reds over the tapestry of architecture and underlying patterns of oak leaves and pine needles. This is an application of a Venetian glazing technique from the Renaissance. Then there was the matter of the windows: how to work with what is normally a dark area as seen from the outside. They took on a life of their own, like panels in a Japanese screen, once I began painting light into them, expressing the inner life this monumental architecture seems to have. It took 3 years to complete. I perservered in completing the project, in spite of setbacks, like loosing the lease on my lake studio, being exhausted for several months with anemia, moving to a building with a toxic air problem and winding up having to move out again less than a year later. 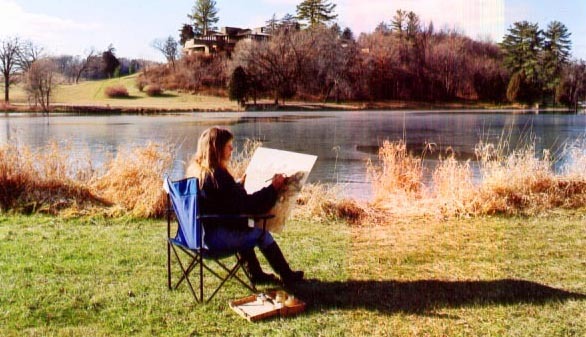 Thus, I put up the show at Taliesin while living in my car, including making twenty frames for the paintings, baking and decorating three cakes for the opening, designing and sending out invitations and press releases and creating a web page for fans and media. This is one of many reasons why they say you must have passion and dedication to be an artist. The studio where I painted most of it. In that glorious time at the lake house, I lived a lifestyle of deep solitude which daily brought me profound satisfaction. I drank in the breathing presence of nature like a woman dying of thirst. I'd get up in the morning and walk through the house, situated like an aerie half way up the bluff, and look down through the living, breathing forest of pines at the water, feeling like the queen of a fairyland. My artistic energies flowed like a waterfall as I painted dozens and dozens of canvases. Steeped in the beauty of nature, I began to surf the crest of the moment, suspend my consciousness on the wave of now, live as Thoreau had written. "It is something to be able to paint a particular picture, or to carve a statue, and so to make a few objects beautiful; but it is far more glorious to carve and paint the very atmosphere and medium through which we look . . . to affect the quality of the day, that is the highest of arts. [Walden Pond, p. 343]"
I hope that you enjoy looking at Wright's work through a painter's eye! To learn more about my life as an artist, see FAQs about the Artist.